I don’t know why the large cheese companies that sell to supermarkets call that stuff packaged in brick form Mozzarella. I just don’t know. It doesn’t have the smell, taste and especially the texture of a real fresh Mozzarella. Of course “Mozzarella di Bufala” is another matter. Try to make this cheese and you will see what I’m talking about. 1/4 t. Lipase powder (optional) If using Lipase powder increase rennet to ½ t.
Dissolve 1/8 t. of rennet in 1/4 cup of cool distilled water and set aside to use later. Add 1-1/2 - 2 tsp. of citric acid to 1 cup cold water and stir well. 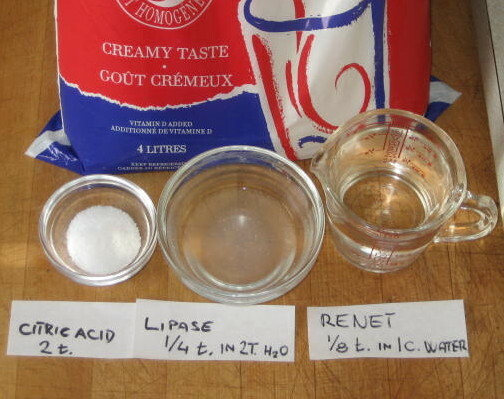 Pour citric acid solution into empty pot and then quickly pour cold milk into the pot to mix well with citric acid. This will bring the milk to the proper acidity to stretch well later. 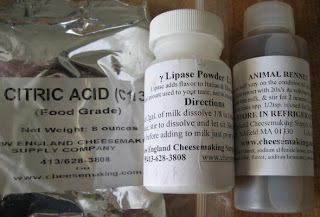 Add lipase solution and mix well. Slowly heat milk to 90 °F. As you approach 90 °F you may notice your milk beginning to curdle slightly due to acidity and temperature. Temp went to 90 and the 210°F was for Rye Bread. NOTE: If you are having problems with milk forming a proper curd you may need to increase temperature to 95 °F or even 100 °F. When at 90 °F slowly add your rennet solution to the milk and stir in a top to bottom motion for 30-60 seconds and then stop. 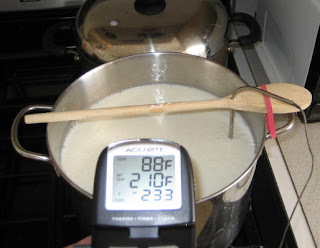 Take pot off the heat and let the milk rest for the next 3-5 minutes during which it will form a curd. It may continue to rise as high as 105 °F. A longer set will result in a firmer curd. Cut the curds into a 1" checkerboard pattern and then scoop with a slotted spoon into a colander and press the curd gently with your hand, pouring off as much whey as possible. Transfer to heat proof bowl. If the curd is too soft at this point let sit for another minute or so. Reserve whey for use in making pizza dough or making ricotta. Next, microwave the curd on high for 1 minute. More whey will run out of the curd. Drain off all whey as you did before. Quickly work the cheese with a spoon or your hands. Rubber gloves will help since the cheese is almost too hot to touch at this point. Microwave 2 more times for 35 seconds each time and repeat the kneading. Drain off all of the whey as you go. Knead quickly until it is smooth and shiny. Add salt near the finish. At this point the cheese should be soft and pliable enough to stretch like taffy. Form it into a ball and drop into ice water to cool and refrigerate. When cold, store the cheese in plastic wrap. The cheese should last for several days but is best when eaten or used fresh. More info and help is available at New England Cheese Supply Company. 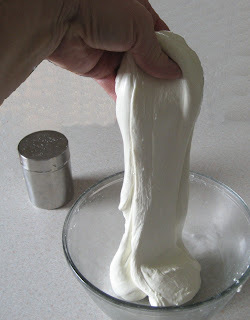 From 4L of milk I made over a pound of fresh mozzarella. Not bad at all.